ICTBroadcast has built-in multi-tenant support. It has two different roles for normal users and administrators. 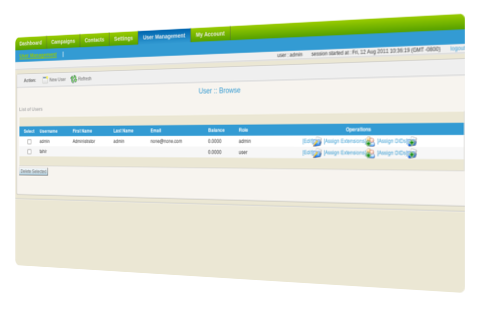 Administrator: This role manages overall resources of system like managing users, configuring trunks, making payments, adding new destinations, setting routes and most importantly allocating any number of extensions, DIDs and channels to users. Administrators can monitor every user, its running campaigns, number of concurrent calls (channels) used and running balance of each user. In the latest version of ICTBroadcast, administrators now can monitor system resources and servers statistics through graphs. Users: This is a normal user that can manage his contacts, manage voice recordings, manage fax documents, make payments, view his/her balance and view call detail reports. This role can also broadcast his message by creating different types of campaigns and interact with its customers/clients and view campaign results/statistics.